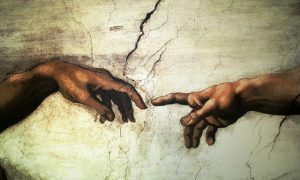 Michelangelo Buonarroti (1475-1564) was considered to be one of the greatest artists of his day, and has been considered so ever since. Some of his most famous works, the Pieta and David, were made when he was only in his twenties. His crowning achievement, though, may be the work he did not want to do. In 1508, Michelangelo began painting the ceiling of the Sistene Chapel at the request of Pope Julius II. Michelangelo maintained that he was not a painter. All he wanted to do was sculpt statues. But the Pope was pretty persistent, and eventually Michelangelo agreed to paint the ceiling “for God.” It took him four years of physically exhausting work to complete it. One thing that Michelangelo insisted on was that he would only do the ceiling if the Pope let him paint it in his own way. In fact, the Pope had hired five other skilled painters to come be Michelangelo’s helpers. Whenever they came to the chapel, though, they found the doors barred and locked. Eventually they gave up and went back home. This is a common characteristic of many great artists. You can tell them what you want done, but don’t tell them how to do it. And they don’t want any help with their art. Great designers operate the same way, because they are artists. Great designers are emotionally invested in their work, because good design IS art. Art with a purpose, yes, but art nonetheless. If you want to control the process of your web design, don’t hire an artist. Hire a run-of-the-mill graphic designer. There’s a place for that. Sometimes you just want someone who can execute your vision. But if you want something great, if you want a design that really makes a statement, then hire a great artist and then turn him or her loose. Also, be sure to give really good directions up front. If your web design must incorporate photos of your store and management team, that is not something to stick in after the fact. Likewise, the time to rewrite the copy is before the design is started, not after it’s finished. If you commissioned a painting of a landscape, and then after it was done asked for a lake painted in the middle, you would lose the inspiration and the creativity. In the same way, a web design as a work of art needs clear parameters and then inspiration with freedom of movement. Otherwise, it becomes production work and not great art. When I was in Germany with my wife, one of the things I wanted to buy was a genuine Swiss Army Knife. 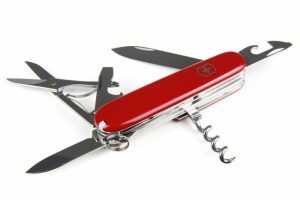 The Swiss Army Knife is a really cool pocket knife that has all kinds of tools attached to it. It seems it can do anything! However, no matter how cool the Swiss army knife is, would you use it to remodel your house? Having a one-size-fits-all, general utility tool is great, but it also has its limits. When I am doing a bigger job, I prefer to use specialized power tools. When you build a website for your business, what tools do you use? 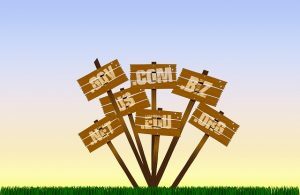 Many small business owners hire a “jackknife” to create their site — the one guy in a garage who does the design work, the programming, the copy editing, the server setup, and the SEO. The “jack of all trades,” like the Swiss Army Knife, may be an inexpensive “tool” that can get you out of a jam. Yet experienced business owners understand that a truly effective website is built by a team. No one person can be good in all the different skills needed to build a website that is your #1 employee. Vice Admiral Lord Horatio Nelson is remembered as England’s most beloved admiral. His innovative style of warfare is responsible for the total defeat of the French and Spanish fleets and the rise of the British Royal Navy to supremacy at sea. 2) A distribution of command so that individual ship captains could make decisions on their own during the heat of battle. At the time, traditional naval warfare required a careful maneuvering of ships to keep them all in a line. This allowed the admiral to communicate with and control his entire fleet, and it also allowed the fleet to escape quickly if the battle went poorly. Usually, this resulted in fairly indecisive battles. 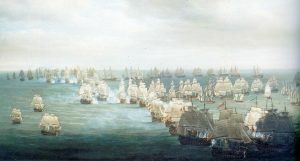 Instead of lining up with the combined French and Spanish fleet, Nelson split his force into two lines and plowed right into the middle of the Combined Fleet’s line. Each of his captains understood the plan of attack, and each was empowered to make independent decisions during the battle. This put all the British ships into a very vulnerable position, where they had to fight fiercely to win. But it also cut off communications between the enemy ships. The resulting battle was chaotic, furious, ferocious — and decisive. 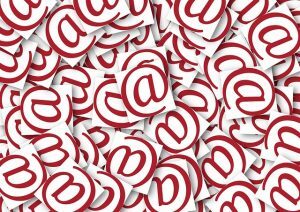 What have you been doing with your Internet marketing? Has it involved years of careful but hesitant lining up of your forces, but without any decisive results? If so, it’s time to take some real action. I had a meeting yesterday with two highly motivated entrepreneurs. They have a small brick-and-mortar store with a niche product in an underserved area, and their store is profitable and growing. 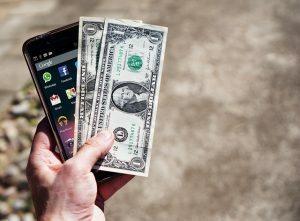 Last year, they got a quote from a friend of mine to build their new e-commerce site, but instead found someone else to build it for only $800. In the process, they saved themselves over $3,000. Pretty smart, don’t you think? (1) They are unable to edit any of the product descriptions without breaking the site. (2) They have not yet gotten any sales from the website. (3) The site does not show up in Google searches…even when you search on their name. (4) Many of the pages take 30-90 seconds to load. (5) Their web guy is no longer answering their phone calls or emails. Considering their market opportunity, a website that was built correctly should be earning at least $5,000 a month for them. They said they would be happy to have $2,000 a month in online sales. In reality, their new site is COSTING THEM more than $20,000 per year in lost profits. How much of a bargain is that?